In France, a TGV, which stands for “train à grande vitesse” or high-speed train, is an electric train powered by electric engines (except the prototype TGV 001, which was powered by a gas turbine-electric generator), reaching regular speeds of 320 km/h on high-speed lines (LGV). It set the world record for the fastest rail vehicle in 2007, with a top speed of 574.8 km/h. 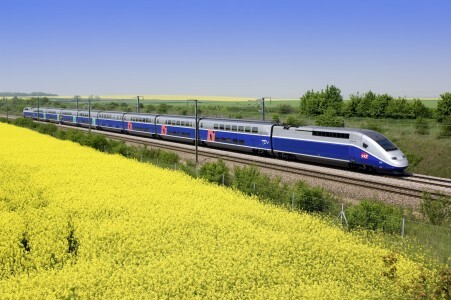 The TGV Duplex is an electric TGV train operated by SNCF, commissioned in 2012. As its name implies, it features cars with two levels. Passengers circulate inside the train via the upper level, which also means travellers in the lower level can enjoy a more peaceful journey. This train meets the current international standards with regard to comfort, safety and access for people with reduced mobility. 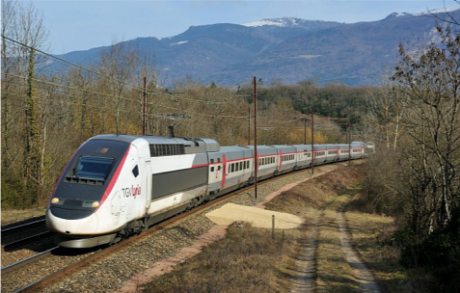 The TGV POS was designed and built by Alstom for the French national rail company (SNCF) in the 2000s, originally ordered for the opening of the East European LGV, in order to provide new train services beyond Strasbourg towardsGermany and Switzerland. The first TGV train on the Paris <> Geneva itinerary was commissioned in 1981. The POS 4402 train set the world speed record on 3 April 2007, reaching 574.8 km/h.